I wanted to just say Happy Thanksgiving from the Good News Bus! I hope that all of you out there have something good to be thankful for. As I sit here writing this I had no real plan but to just say Happy Thanksgiving....but I must take it a step further and tell you all, just some of the many things that I am personally thankfully for. The Lord has blessed me with a great wife who (makes a great Thanksgiving Dinner) loves and respects me (that is huge), I am thankful for 6 (yes 6) beautiful children. I can hear what your thinking; "No wonder he needs a bus!" Most of all I am thankful that in 1996 I met the Lord in a very real way. Allow me to just share briefly about that experience. I was raised in a religious home and although we attended church regularly it always felt (without knowing it) that I was going through some kind of religious motion. I wasn't doing it because I wanted to but because I thought that is just what I was supposed to do. When I reached my teen years I was a bit tired and bored with church. When I did read my Bible I noticed that there was always amazing things surrounding God and so much Life when people interacted with Jesus. One of my favorite parts to read was 1 Kings 19 when Elijah flees for his life. So many times we expect God to speak in this loud thundering voice, but so many times He speaks in just a whisper and half the time we don't want to listen to what He is saying. I also remember reading the stories about Jesus. There was always life surrounding Him. Think about it. The Blind left seeing, the crippled left walking, the deaf left hearing, the broken hearten left whole, the dead left living. I remember asking myself as a young 17 year old; "Where is THIS God in my church?" Where is this kind of life in my church? When I was 18 an acquaintance of mine invited me to a different church where he had met the Lord in a very real way. I remember standing out in front of the church before the service started and I prayed a simple prayer; "God if you are here for some reason, please, I want to know you. I don't just want to read about you, I want to experience you. I am sick of religion, I want a real relationship with you." I know that sounds so simple but all I can say is that night my life changed from the inside out because I was willing to allow Him to do it. God took my heart and made it new. My desires and focus changed. After that I was able to attend a mission trip to Germany where I saw the Lord not only do more in my life, but so much in other peoples lives. Many Many young people came to know the Lord in such a real and powerful way so much so that they gave up many things to follow the Lord. That first trip was the first of many. I was able to go on more trips to Switzerland, France, Holland, Italy, England and finally Canada where I met my wife! We have been married almost 11 years now and still love the Lord, each other and our six children. We have so much to be thankful for today. We hope you do too! God Bless from The Good News Bus! When I found your video on YouTube, I thought you might be a brother in Christ. 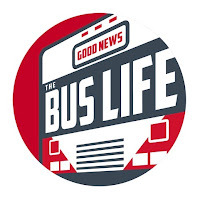 After all, who else would name their vehicle the Good News Bus? All I can say after reading this is what a powerful testimony! The paneling is oak plywood and the trim is pine. Awesome testimony! And what size and brand of oven do you have?